Innovations Sculpted Ecru offers an ultra-realistic wood grain finish with the Embossed in Register technology that ensures each plank surfaces texture precisely matches and coincides with the underlying pattern. This technology creates an amazing and authentic look. This floor is an AC4 rated product, approved for general commercial traffic; suitable for your home, office or other light commercial applications such as boutiques and hotel rooms. Each plank is 11-1/2 mm thick and 11-1/2 in. wide x 46.56 in. long. This wide plank flooring reduces installation time as well as having fewer joints which maximizes structure strength. Easy to install, with each tongue and groove fully sealed with wax and oil emulsion to prevent moisture penetration and our patented JointGuard protection from joints peaking or chipping provides a quick and secure installation. Our limited lifetime residential and 5-year light commercial warranty guarantees the floor will not wear, stain or fade. Our flooring is certified by the North American Laminate Floor Association for our overall quality, durability, strength and performance as well as the GREENGUARD Environmental Institute for GREENGUARD standard for Low Emitting Products. When you choose an Innovation Floor, you are choosing an exceptional performance, value and versatility floor that provides a worry-free choice for active households with children and pets. 14.87 sq. ft. per case. Case quantity: 4. Case weight: 32.0 lb. Buy online Innovations Sculpted Ecru 11-1/2 mm Thick x 11-1/2 in. Wide x 46.56 in. 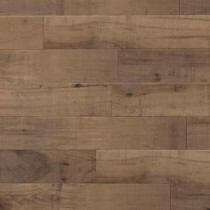 Length Click Lock Laminate Flooring (14.87 sq. ft. / case) FL50018, leave review and share Your friends.